Everything They Never Taught You in Grad School! You want to organize your materials, plan your lessons well in advance, and start each day feeling fully prepared. You want to get things done before the due date, write detailed IEP’s and have good relationships with others on your team. But more than anything, you want to be respected by your colleagues, admired by your students, and feel confident. You thought you could figure this out on your own, but now realize that being a school-based SLP involves loads of paperwork, minimal prep time and very little outside support. Confused about how to start the year effectively on the right foot. Juggling piles of paperwork and unsure how to prioritize these while trying to keep yourself sane. Seeking guidance and reassurance that you CAN do this but don’t know who to ask for help. Overwhelmed by the scope of this job and realizing that grad school only taught you about 20% of what you really need to know to do your job right. Right now I know you’re overwhelmed and wondering where to start in planning your year, but I want you to know you can do this. I CAN HELP YOU HAVE YOUR BEST YEAR YET! Introducing The Organized SLP, a hands-on video-based course for motivated speech pathologists, who want to start their school year organized and well prepared. ★ Step by step directions through four different organizational systems including lifetime access to videos, materials and templates. ★ Tons of high quality materials to use with students and paperwork from one of the top 10 speech therapy stores on TPT. ★ A community of supportive students in an exclusive Facebook group. ★ Handholding, encouragement and coaching by your best cheerleader, me! I’ve designed The Organized SLP so that you can get access to all of the guidance, information, and encouragement that you need to get organized without scouring through thousands of blog posts and forums. HI, I’M CHERI CHIN, MS, CCC/SLP, CREATOR OF THE ORGANIZED SLP. I have the longest-running blog in the world for speech therapists just like you who want to be organized, feel confident, and empower themselves to work to their full potential. I have spoken at national conferences (including ASHA) and been featured multiple times in the ASHA Leader. I’ve created The Organized SLP because everywhere I look, I see smart, enthusiastic, and dedicated speech pathologists that love their students. They are people like you with the education, passion, and drive to make a difference in the lives of others – if only they could establish organized systems, effective routines, and planning skills to minimize the time they spend on paperwork. I came into the field of speech pathology completely by accident and was completely lost when I entered my first job. Then I moved states and was lost yet again. I was exhausted and overwhelmed. I created The Organized SLP in order to empower others to become organized and to help them develop efficient habits and routines for themselves. I don't want everyone to have to go through the trial and error that I have experienced for the last 18 years. There are no other online organizational courses for speech pathologists. This is your chance to improve your skills and feel prepared for the upcoming year. I want you to feel that your time and energy goes into children and not paperwork. I want you to leave work at a reasonable hour and never take work home with you. I want to you to feel confident, prepared, and assured. I want you to be an organized SLP. In this module, you will work through your goals for the whole year and then narrow down your focus to the month, week, and day. This module is going to kick start you into gear to make some pretty big organizational and habitual changes to your life as an SLP. 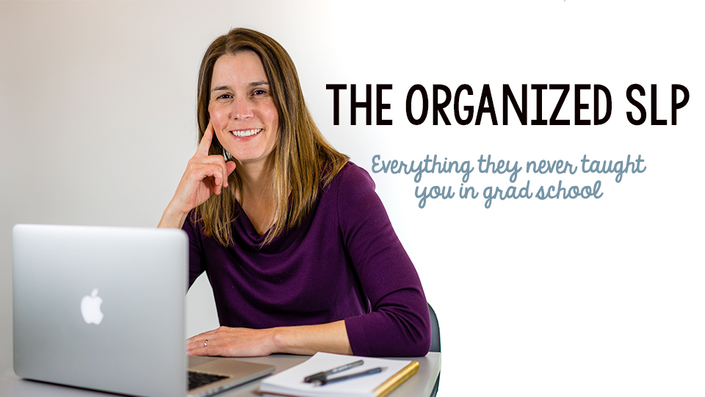 "Module 1 is a super practical, step-by-step way to help you get organized for the start of the year. It all stems from your organizational goals and how you want to improve. Then, additional lessons provide useful ways to help you reach them. I love all of the tools and materials that were introduced throughout the module. They will make a huge difference in my organization, and ultimately help me to make the most use of my time." This module digs into who your students, teachers, and parents really are, and how you can best provide for them. You will be given step-by-step guides and templates to prepare others as well as yourself! "I wish I could have taken Module 2 when I was a first year SLP. It would have saved me so much time and helped me to feel not quite so overwhelmed! Even though I'm no longer a first year SLP, I have taken away countless practical ways to improve beginning of the year tasks, such as setting up student files, preparing teachers and parents, and scheduling. These lessons are a game changer and make me so excited to start a new school year to implement all the ideas and strategies I've learned!" Everyone wants to find easier methods to lesson plan. This module includes several effective methods of organizing materials and a simple way to create monthly lesson plans which will transform your organization for therapy. "This module helped me learn to break down the lesson planning process so it does not feel so overwhelming. Often times, lesson planning gets put on the back burner for me with all of the paperwork. I am excited to use these tricks and ideas so I don't feel so frazzled throughout the week, and I have a plan ready to go!" "Why didn't anyone show me how to do this before??? This is going to really help me be a better SLP." In this module you will learn how to rock out a data-driven informal assessment and IEP. You will be given tools to directly support your IEP writing skills. "This module will really help ease your nerves about the IEP process. It provides so many great resources that allow you to approach IEPs in a calm and confident way!" The Organized SLP Facebook community is one of the highlights of the course. You get to share in the joys and challenges that come with being a school SLP. Homework assignments will be posted to this group so that you can get encouragement and feedback from other students. "The community the Facebook group creates another layer of utility to the course. Although I am generally not a big Facebook user, I loved seeing the perspectives other people brought to the group, as well as what they created for the Lessons." This course also comes with tons of free materials from my store. In the lesson-planning module, you get to have a “shopping spree” to create an additional wish list of $50 in products from my store. You cannot beat this incredible bonus offer! "The materials and the Facebook group have been the most valuable to me. Getting to hear from everyone and how they're using the materials is a great way to get motivated to re-organize your own life." You are passionate about becoming your best SLP self, and you’re willing to put in the work to make it happen. You would love guidance and help to feel organized, and you are open to adapting ideas to best fit your needs. You are excited to spend extra time and effort at the beginning of the school year making the rest of the year run smoothly. You want someone else to organize your work for you. No one can do it but you. You don’t have the time during the summer to devote to really making your next school year fabulous. The summer 2018 course will run from 6/11-8/3/18. Because this is an online course, there is great flexibility as to when you actually begin and end the course. I always take vacations into account, so modules are two weeks long to give you extra time to complete! Does this course include continuing education credits? No. ASHA has strict requirements that continuing education credits can only be obtained through organizations with committees and sub-committees devoted to that purpose. As an individual, I am unable to offer CEUS. That said I believe that the knowledge and confidence that you will gain from this course will far outweigh almost any other course that you might take. I do, however, provide you with a certificate of completion that your district may accept for continuing education. I have combined my 18 years of experience, hundreds of blog posts, and 180+ materials and wrapped them all into one awesome course for you. This course will save you hundreds of hours of time finding this information yourself. The total value of this course (including bonuses and office hours) is over $700! Will this course work for SLPs in pre-school and high school settings? I work in an elementary school setting and my materials are primarily designed for that population. I have, however, had numerous students go through this course who work in a middle, high, or pre-school setting. They did need to adapt certain elements to better meet their needs and not all of the downloads were applicable. If you are in one of these settings, note that not everything in this course will apply to you. Will this course apply to SLPs living outside of the United States? No. This course follows federal IEP guidelines and will not meet the needs of SLPs in other countries. That said, numerous SLPs from outside of the United States have found the organization tips and materials to be completely worth the cost! I suggest that you initially go through the course quickly with a hypothetical caseload. This will require about one hour of lecture materials per week and 1-2 hours of homework. After your school year begins, go through the modules again with your actual caseload and students’ needs and re-do the work. You will have lifetime access to the course, so you can go through the materials at your own pace on the second time around. Can experienced SLPs take this course? Yes! If you struggle with organization, then this course is for you regardless of your years of experience. There is always more to learn and new ideas to try out. Of course I want you to be happy, so there is a 100% money back guarantee if you go through all the courses and homework in the first module and still feel like this course does not meet your needs. However, you must request your refund within 14 days of the course beginning. There are no refunds for any materials that you have requested from my store. I know that being a school SLP is difficult. It is an ever-changing field with a huge range of children. I have found that the best way to meet the many needs of my children is to be well organized. Don’t wait until you are 15 years into your profession to figure these things out on your own like I did. Learn from my mistakes, trials and errors and really spend this time to invest in yourself. I’ll be there to help you every step of the way! Use your summer productively and take advantage of this course before beginning your school year, you don’t have time to waste. This course is only offered during the summer. Do not wait another year to achieve your organizational goals. With just a 8-week time investment, you can improve your entire school year.